Slip, glorious slip. This versatile liquid form of clay can be used in a multitude of different ways to create and embellish ceramic art. One such method involves using colored slips to create a marbleized look on pottery, which is reminiscent of Staffordshire-style English marbled slipware. In today’s post, Michelle Erickson and Robert Hunter demonstrate this process. Enjoy! – Jennifer Poellot Harnetty, editor. Gravity and centrifugal force are key elements for inducing the movement or flow of slips during the marbleizing process. The term “joggling” is used to describe the physical act of controlling this movement, which requires very specific, and somewhat awkward looking body and arm movements. The degree of aesthetic success is directly linked to the skill of the potter in controlling the flow of the slips. Erin Furimsky shows you how in her Layered Surfaces DVD. The making of a Staffordshire style marbled slipware dish begins with a flat clay disk or slab rolled out to a consistent thickness. The slab is supported on a board or bat to bear the wet and still plastic clay. Pour a coating layer of slip over the slab, covering the entire exposed surface, allowing the excess slip to drain off (figure 1). Immediately thereafter, trail a systematic series of lines in a contrasting slip across the entire surface (figure 2). Hold the tip of the slip tube above the surface as it should not touch the wet base slip. The distance between the tip of the slip tube and the surface of the ground slip dictates the width of the lines; the further from the surface, the wider the line. Trail the lines one at a time, in a continuum within the confines of the slab disc, doubling back for each consecutive line. After the slip lines are systematically applied, the clay slab, still supported by the bat, is then tipped and rotated using gravity to coax the slips to flow (figure 3). This process will create a pattern of swirls. If the slip is too watery, the lines will run and blur. If the slip dries too quickly, the slips will not flow properly. Two conscious aesthetic and practical decisions have to be made: (1) how much time can be expended before the wet slips stop flowing; (2) how to judge when to stop before the lines of color lose their separation and become muddy. Because both slips tend to firm up quickly, the elapsed time for joggling is usually 30 to 45 seconds. The now marbled slab is set aside to allow the slips to dry further. Before the vessel is formed, the slips must be allowed to set up to prevent marring of the marbleized surface yet the slab and the newly slipped surface must remain pliable. If the slab becomes too dry, it will crack. If the slips are still too wet, the slab will stick to the surface of the mold. After the slips are no longer tacky or wet to the touch, the entire slab, which is still plastic, is removed from the bat and placed over a “hump” mold surface down and pressed into shape (figure 4). These molds were typically made of fired clay although a plaster one is being shown here. Allow the dish to dry further to a leather hard stage. The irregular edge is trimmed with a knife to form a completely circular form and the rim is then crimped or pressed with a coggle wheel to create a pattern. The molding process helps flatten the slips and after glazing, the surface is smooth. clay, leather hard, set, slip. Curmudgeonly, hardly! Charming and informative. Can the same be done with glazes? I’m not sure the colored liquid slip would blend with the drier porcelain body of your vessel. An idea to try would be to make a porcelain slip from your porcelain clay body, and another tinted with oxides or colorants. That way one of your slips would still be white porcelain, and the other a colored porcelain, and they would probably blend nicely. Best of luck, hope this helps. Suivez ce lien, puis couper et coller le texte de la page. Google Traducteur saute tout simplement les images, mais vous donne une note sur où ils sont dans la page. Some plates made in this method . I have a batch going into the kiln today as well ..
And here is a pottery made Gravity flow trailer I make ..
BFN were you with Joffy & Dorthy Snell at Wetheriggs when Sharry Stevens Grunden was there ?? . She worked with me and after I stayed with the Snells in the early seventies I sent her along.I think she got there before the introductory letter I sent .. I loved working with Joffy . We had a time together just after Harold left them .I had worked at the traditional American Pottery Jugtown in 1969 and in the village of Ewenny in Wales the next year so we had lots to talk about “Traditional pottery ” . Ive been trailing with a cows horn with a birds quill nozzle since those days. In the Late 70’s and 80’s mostly cobalt on salt glazed New England wares . With the economy I have done a ton of redwares the last 15 years . Mostly making 30 tons flowerpots a year for historic gardens though. So many exciting potters working in great heritage directions now in the UK . I am espeicialy excited about Douglas Fitch’s work with slip .. Have a look at my facbook photos for some slip work of mine and Douglas is on there as well as Hannah McAndrew . .. The explanations here are lots of fun to see. Keeping your slips a close fit to the clay in the plate is worth keeping in minde the wilder and thicker you go .. Thinking of those great English panchions where the white slip is popping off is a thing to remember .Clay fit or slips fitting the clay body is worth keeping a watch on . Also, Ginny, if it doesn’t run to your expectations, you can always rinse the bisque ware off and glaze again after drying! I, too, would appreciate a pointer to a coggle wheel. Didn’t even know what they were called, but it would make a great item to add to my Christmas list. Really enjoyed this article. I am anxious to try it out myself! I noticed your use of a coggle wheel. I have been looking for one as the one I made leaves some to be desired. Can you tell me where I might find one? (or a selection) Thank you! Darlene, In the instances that I need the clear trans. glaze, for Cone 6 oxidation, I use a Duncan Cone 06 premixed transparent gloss or matt. Both come out glossy and very smooth and clear at the higher temp. (on my s112 clay) Just know that if you are using a very iron dense clay body (like Zam07), I have not found anything that doesn’t seem to get opaque. Ginny – no, as the slip would crack when you refired it. 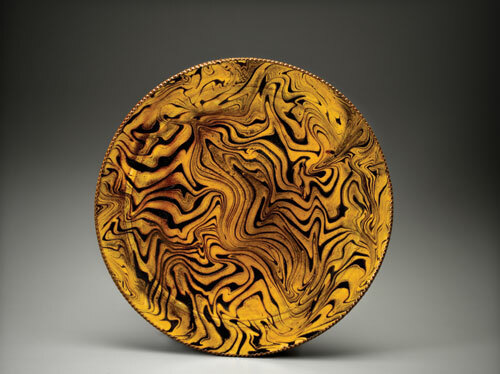 Darlene – trad English marbleware often had a honey iron glaze (fired to eathenware temperatures), so it was dark brown and golden in pattern. IME, it’s much easier to get a good glaze with iron in, than a transparent one – I struggle with that too. So, no one has responded to my question at the top, so perhaps I’m out of line here, but I’m really curious! I know that slips are not used on bisque ware, but can underglazes or engobes be watered down somewhat in order to flow over a dampened bisqued surface? Then, when they are dry, a clear glaze applied? Also, I’ve read that spraying a dilute gum solution over slip or underglaze will help keep it from smearing when the clear glaze is applied. Is Michelle Erickson going to respond to any of these posts? How can you marbleize on leather thrown pieces? Don’t you have to lay the marbleized side down on some porous surface to flatten the slips? And what would you use to apply slip if not using a slip bulb? how do you make the consistence of the slip to be flowing, not blending and not drying too fast. Does anyone have a formula? soooo very funny – alex’s description of how to “shooogle” it about!!! I will certainly give it a try, even if just for the exercise of it!!! hehahhaaaahhaa!! thanks for your posting and your wonderful description of your learned technique. From me, all the way from Sunny South Africa. I learnt this and other slipware techniques from Harry Juniper at Saturday morning classes, but I do live in North Devon, slipware country. Yes, well, I’ve been practising marbling since I learned how to do it about thirty years ago at Wetheriggs Pottery near Penrith in Cumbria, England. Taught by Joff Snell, who was taught by Mr. Schofield, who was taught by Mr. Thorburn using slip and glaze recipes that had been handed down for generations. Not lost in the mists of time. No, I haven’t written a book or made a DVD, nor am I a university professor – just a working potter for thirty-odd years. To Lynn – marbling necessarily requires there be two contrasting colours of WET SLIP which are marbled on the ware by shoogling about (watch some modern dance for tips on technique). If you want to just have your porcelain body, then you must marble using two contrasting bodies – one plain, the other with body stain, loosely wedged or banged and then thrown, to be turned or sanded (make sure you breathe in as much dust as you can bear) later – revealing the marbling of the bodies. In my opinion not as nice as slip marbling, but I did train in an English Slipware Pottery, so I might have a bias. Hope this hasn’t come off too curmudgeonly, but, och well. Nice and clear and very helpful something that I could play with for sure. Check out the work of Irma Starr in Kansas City, she is the one who discovered the formulas for the English slipware with research for the Nelson Atkins Art Museum years ago. Wouldn’t be easy to create a porcelain slip from your clay body as the first slip layer? That would give you the desired background. From the above directions I understand that there must be a delicate balance between the amount of water (dryness/wetness) of slab and slip layers to achieve the pattern. Nice! What is your formula for the slip? Conversely, can this be done on porcelain, without the first coating slip? What I am looking for is to do something like this on the pure white of porcelain, so obviously having an extra layer of another coloured slip would negate the whiteness of the porcelain. Nice clear description! Is there any way to do this on already bisque fired plates? ?